First of all, I apologize for delay of this long awaited and final installation of Amber Chia’s Home Feng Shui series. I have been extremely busy with the filming of the upcoming Feng Shui TV series and the preparations for the Feng Shui Professional Course (English and Mandarin) in Kuala Lumpur and Penang respectively. Normally, there are more feng shui audits after Chinese New Year and all these basically took up most of my time. Rest assured that my readers here will still have my utmost attention shall you have any feedback, comments or questions. Basically, in this last and final article about Amber Chia’s Home, I will only touch on the issues which are approved by Amber due to her rights of confidentiality. I will only discuss about the Positive Aspects of her home. In this article, I am very selective and will only zoom down to a few issues which are relevant and appropriate for public discussions. 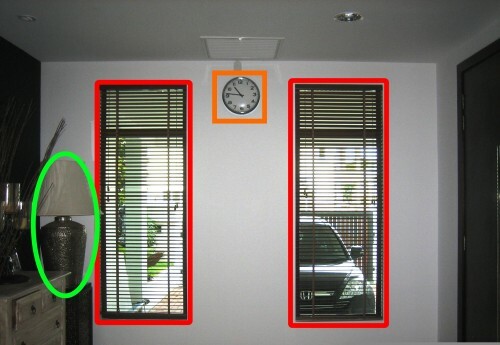 The windows are covered in a dark brownish wooden blind and in the upper-middle of the wall is a white wall clock. What are the feng shui implications from this observation? Use your Yijing wisdom to analyze and may the truth reveal to those who have a pure heart. In terms of Yijing feng shui 易经风水, window is classified as Li trigram 离卦. 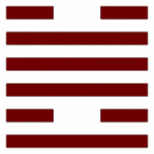 Li trigram symbolizes a lot of aspects like love life, companion’s character, financial status etc. In this case, the hexagram is 泽火革，Revolution (Refer to image below). At this critical moment for interpretation, you as a practitioner should switch your way of thinking into a symbolic thinking system 类比思维， with Mandarin mode of philosophical comprehension. Lots of secrets are hidden at North West sector. May the truths been revealed to those with pure heart. When you enter into the house, there is a huge mirror facing the main door. A few white candles are placed just right in front of the mirror. I advised her to remove all these. What is the feng shui effect with this original setting? Do you know the implication to her money luck and social relationship? The picture above shows the master bedroom of Amber Chia. She was sitting on her bed listen to my advice. A few important remedies are proposed to her in order to rectify her condition. Bed room represents her love life and romance. By looking at the bedroom photo here, could give you further insight into her love life. Sleeping in this () sector with chocolate color and this kind of bed orientation definitely would lead to this kind of outcome. Please pay attention to that stand lamp with special design at the corner. If you are feng shui master, you should know the answer. The Bottom Part of the Bed Was Pointing the Door Opening to Balcony. There is a huge Amber Chia’s portrait at South West. SW represents 坤卦 Kun trigram, which means the female owner of the property. Obviously, the sector of Kun (SW) is much higher, spacious and open compared to NW, which represents the male partner or the husband. This means Amber Chia’s character is strong, vibrant, outspoken and energetic. On the contrary, the NW, the male partner is hidden, secretive, unseen, veiled and buried. I think you are smart enough to know the answer. Last but not least, many other remedies which are personal and private will not be disclosed here. However, if your foundation of Yijing 易经 is strong enough， you are able to unveil the truth based on the information I have discussed in all my articles.